This post may contain affiliate links, which means I can earn commission on purchases at no added cost to you. Thank you for your support! The Whole30: The 30-Day Guide to Total Health and Food Freedom – This was the book that inspired me to try Whole30. Gifted to me by Andrea (Loubies and Lulu), it’s one part informational and one part cookbook. It gave me all the guidance I needed to start the journey, along with recipes to try. 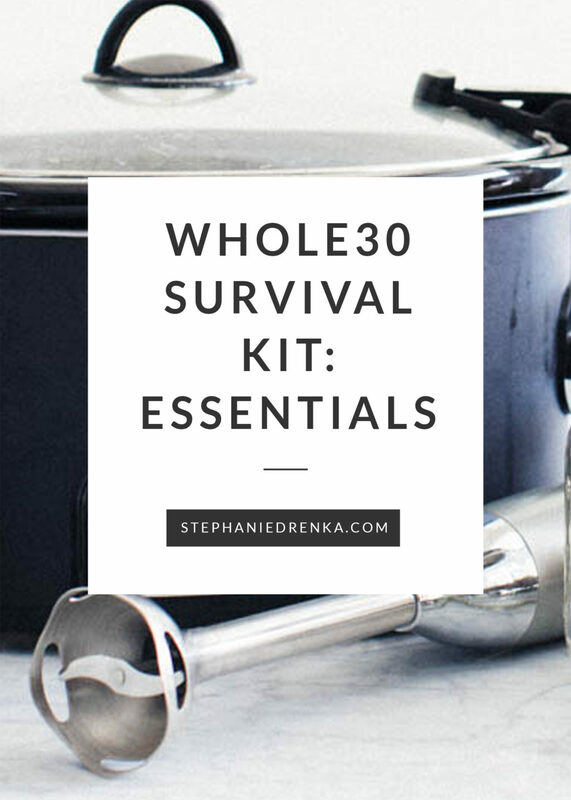 One of my favorite sections has basic instructions – how to make the perfect scrambled eggs, or roast vegetables – tricks that have helped me throughout Whole30 and beyond. MCT Oil – Adding MCT Oil to my Whole30 regimen this time around has helped my energy levels significantly. A tablespoon or two incorporated into my breakfast (mixed into almond milk, on top of spinach, or taken by spoon) keeps me feeling more full throughout the day. MCT stands for medium chain triglycerides (found in coconut oil). It has been found to help treat disease, obesity and is used by athletes for its energy sustaining powers. Coconut Aminos – One of the foods I miss most during Whole30 is Asian food. Our typical dinner usually consists of Thai or Korean takeout, sushi on special occasions, and sometimes just white rice, spam, and a fried egg. Soy sauce is my biggest guilty pleasure. I pour it on whatever Asian food I’m eating, even if it’s already sufficiently seasoned. I’d been having bad migraines, and wondered if soy could be the culprit. Thank goodness for coconut aminos. It’s touted as a soy sauce substitute during Whole30, but I actually love the taste even more than the real stuff. It’s the perfect mix of sweet and savory– adding a kick of umami to food. I always order two bottles at a time, because we go through this stuff so quickly! 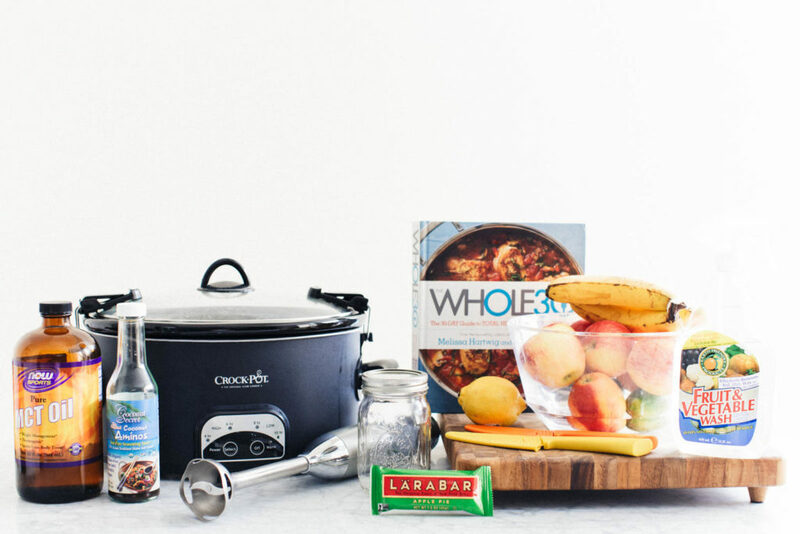 Crockpot – My slow cooker has been a saving grace during Whole30. For someone who is not used to spending a lot of time in the kitchen cooking, easy slow cooker meals help me take care of all the other things I want to do besides slaving over the stove. I’ve found some great easy recipes (and experimented with my own) this time around, and plan to incorporate them into our regular meal plans after the challenge is over. Meal prepping is more productive when I can have something cooking in the crockpot while I take care of other things like hard-boiling eggs and preparing dump ranch, etc. Tonight I’ve got balsamic chicken cooking so I’ll have something ready for lunch tomorrow. Immersion Blender – This immersion blender is possibly the single most important Whole30 tool because… it helps me make DUMP RANCH! Dump ranch is what not only kept my husband on track during last year’s Whole30, but it’s what made him beg to do Whole30 again now. It’s simple to use and clean. Besides dump ranch, I use it to blend almond milk with dates and MCT oil for an occasional breakfast drink. Mason Jars – I love using mason jars to store things throughout the week. They come in handy with leftover dump ranch, caramelized onions, chia puddings, and more. Citrus Knife and Paring Knife, Cutting Board, Fruit & Vegetable Wash – I’ve never eaten more fruits and veggies than I do during Whole30. These items are essential for prepping all of the produce needed for meals and snacks. Larabar (Apple Pie) – These delicious apple cinnamon bars are my emergency snack, if I need an extra burst of energy or my stomach starts growling between meals. Just be careful not to rely on them as a dessert replacement, or snack too often. I try and limit myself to 1-2 per week. Absolutely LOVE this post and just added some MCT Oil to my cart. Also, thank you for inspiring us to do Whole30! Doing the #JanuaryWhole30 with you has been tons of fun and we can’t thank you enough for supporting and motivating us (especially when I was about to pour myself some wine – yikes)! A million high fives to our last week + a few days!